I have a vivid childhood memory about jam. I was in the grocery store with my grandma and I asked for some jelly that had Disney characters on it. The marketing totally worked there, Walt. My gramma (That’s how I’ve always spelled it when referring to her) looked at me like I was crazy and said, “Why would you want that? I make jam, and it’s delicious!” She wasn’t kidding either! Her jam was always amazing! A very frugal woman, she always made jam with the fruit that was in season and at it’s very best. I didn’t learn to make jam from here, though. She taught my uncle Jimmy and he went NUTS! 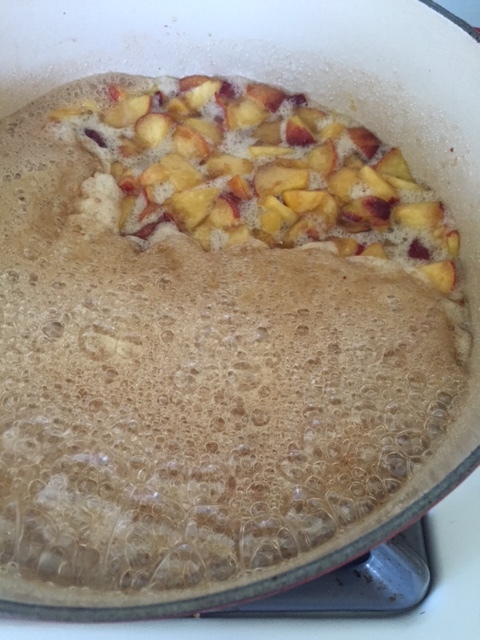 He was making batch after batch after batch… Plum, peach, pear (yaaaassssss), cherry, strawberry and more! We called his jams “Jimmy Jams” and he turned jam making into a science. He is who I learned to make jam from. I don’t do it exactly the way he does, though. I don’t do a boiling water bath and I try to jazz things up by adding ingredients not usually seen in jams. 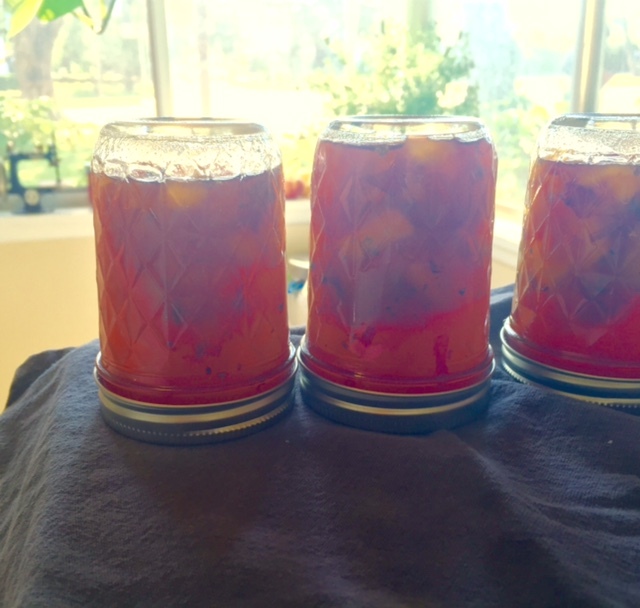 I made my first batch of jam shortly after we moved to Pasadena as a result of having a high yielding apricot tree. It’s a small tree but the first year I got over 15 pounds of apricots from it. I literally had to fight the squirrels, though. When I say “fight”, I mean I heard them outside my bedroom window very early in the morning totally jacking my fruit! I jumped up, threw on some clothes, put my almost one year old in the stroller and ran out there. I had to shoo them away even! They were not budging… I was clearly infringing on their territory and it became a battle of wills. I waved my arms around in a ridiculous manner, they looked at me with their beady eyes and promptly ignored me. I started shaking the branches. They nimbly scurried from branch to branch unfazed. So, I did what any self respecting swearing mom would do and I started yelling and cussing and nearly swatting them out of the tree. We had only lived in the house on the corner lot of the sleepy Pasadena neighborhood, for a couple weeks. I believe I made a proper impression on my neighbors that morning. 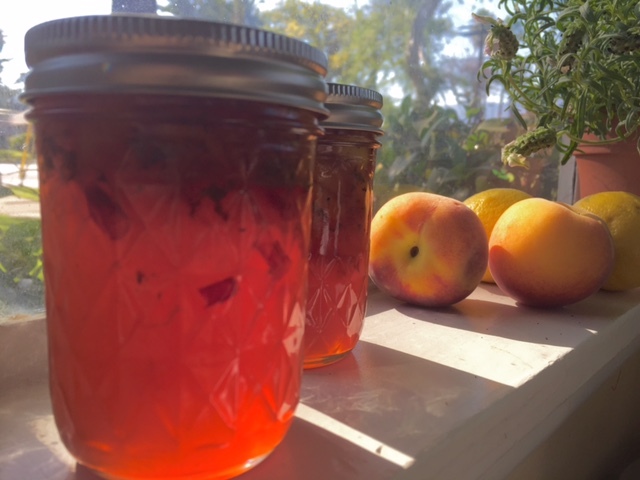 I went into a kind of jam frenzy that summer and came up with a few combos that were real winners. The one I am going to share today is a favorite and has impressed every person who has ever been on the receiving end. *NOTE: the peaches in the recipe can be subbed for nectarines or apricots for equally fantastic results. * 7 cups sugar (I use a combo of 5 cups turbinado and 2 cups light brown for an extra richness that may only exist in my head but, white granulated will work fine. 1. 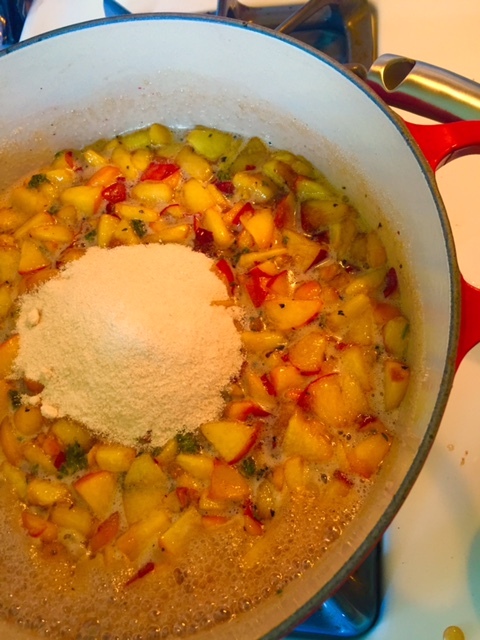 Pour sugar, fruit and lemon juice into a heavy bottomed sauce pan or Dutch oven. I always use my Le Creuset Dutch for this. 2. Heat over medium fire until sugar is melted and the mixture is soupy. 3. Let it simmer for a couple minutes adding a pat of butter if it gets too foamy. 4. 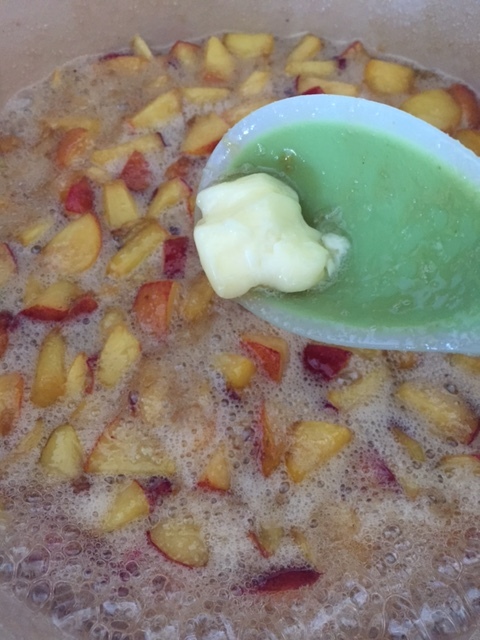 Add your pectin all at once, stir it in until dissolved. 5. allow it to continue to simmer for another 5 minutes or so. 6. Pour into clean half pint jars and screw on the rings and lids. NOTE: Don’t be afraid of this process. Making jam is simple and FAR less expensive than buying it in the store. I made 8 half pints for less than $12 and I am in complete control of my ingredients! BOOM! Previous Post Day Three Give Away! Thank you. May have to tweak the sugar a lil bit, I’m Diabetic. Just got apricots today.